You will have gathered that I may have been a little busy since Christmas and hence I have not been writing Chaplain’s letters. I have not spent all the time reading Harry Potter or watching Paddington 2. I have been to Walsingham three times, I have given a retreat on Film, I have been to Cross Green for Holy Week, a brief visit to Belfast to plan an auction. Oh did I mention we had an auction? I think in terms of fun and joy that was one of the best weekends of my life. Everyone seem so happy, there was a great team of helpers and everyone went away satisfied. The result of Auction was superb. When all is in we will have raised about £25,000 which is good going for a Vth auction. 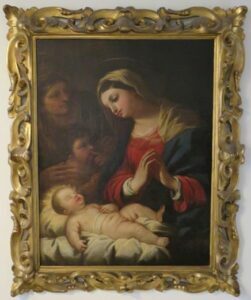 Many people will be relieved to know that we did not sell the Luca Giordano painting although the bidding came very close to the reserve. I feel vindicated in that it has proved to be a more significant piece of art than was previously believed and I hope now to enjoy it for the rest of my days. Hard on the heels of the auction we had the Family Fun Day when I turn my talents to assisting in the sale of hot dogs. As I write we are in the middle of a Monastery Experience week and preparing for the Festival weekend which in turn will be followed by General Chapter. It is great to have such an easy life.